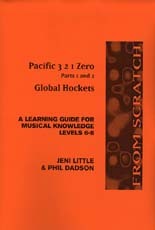 A learning Guide for musical knowledge levels 6-8. This guide contains a wealth of information and activities for teachers and students on the music of New Zealand's first avant garde percussion ensemble, From Scratch, founded in 1974 by Phil Dadson. Phil Dadson is a sound, video, performance and installation artist and composer, and co-author of this guide which covers background information, biographical material, analysis of works, application and recall activities, and much more. 73 leaves : ill., forms, music ; 30 cm.